The Western Regional Planning Panel met yesterday to discuss the Woolworths development on the old Colless site in Leura Mall. The business paper presented gives the latest info on the proposal for a 1400sqm super market plus speciality shops (by comparison, Katoomba ALDI is about 1200sqm). The key message from council is the revised development is head and shoulders over the previously approved retail/residential multi-story development on which building work has now ceased. The revised Woolworths proposal retains the two historic shops (currently Goodies supermarket) and adds three new shops on the Mall in keeping with the surrounding premises. Entry to the supermarket will be from a corridor running from the Mall to the car park, or via a ramp up from the proposed below ground parking. There appear still to be some issues around signage, traffic and trolleys, which should be scrutinised based on the experience of previous developments where “nothing could be done” once building was complete. 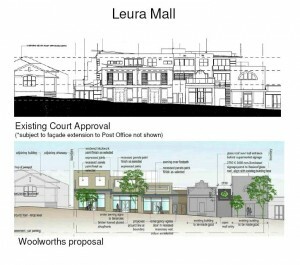 Whether a major supermarket open 7am to 10pm will be a benefit to Leura is highly questionable, but at least the new proposal looks a little more in keeping with the township. This entry was posted on Friday, March 12th, 2010 at 3:53 pm	and is filed under Mountains Life, News. You can follow any responses to this entry through the RSS 2.0 feed. You can skip to the end and leave a response. Pinging is currently not allowed. Looking forward to this development being complete as it will be a real convenience and give coles Katoomba some much needed competition that has not come from anywhere in the time they have been the main local supermarket. I feel at this time the new building has given a new lease of life to the mall , I was born and raised here most of my life and to be honest unlike the spires I believe this could be the most positive development yet for leura’s future,not only for visitors but attractracting more locals back to our beautiful village instead of katoomba’s coles where most of the time is filthy with rubbish!